We just received some great news—that is, in a way. There is no more censoring of letters. Now, we can write a few things now and then—at least I can try. I just got back from Leyte in the Philippines, September 6th. We are at this time in Okinawa, at the main anchorage where the Jap fleet used to anchor. That is, until they saw us coming. Hundreds of ships of all descriptions are anchored here. It is a real sight if you have never seen that many together before. In four or five days, we are shipping for Tokyo to sweep all mines and allow the fleet to get in. I wish we could get out of it as mine sweeping is far more dangerous than anything I have seen so far. We have pulled through many times and I feel certain we will on this assignment. It sure seems good to be without air-raids, etc., especially Jap suicide planes and robot bombs. As far as that goes, they are all unwelcome. I hope to never go through the Hell of war again. One war is enough for any man. I imagine you want to know a little of what we did way out here. Several days before the invasion of Okinawa, we started sweeping with six sweepers (ships) for the invasion. As we drew close to land, with each sweep we could see the Japs only a few hundred yards away. They did not bother us for several days. When we’d worked our way in between the islands, where there was only one way out, they opened up on us. All we could do was try to run for it. All but one ship behind us made it. She had a direct hit. The next day, the second ship behind us hit two mines. Shortly after that, the next ship hit two mines. That left us three ships out of six. Believe me, we were worried. Who is next was all we could think about. A few days went by until one more ship got a direct hit, leaving two. Fortunately, we made it—with God’s help, I am sure. I am telling you, Mom, it was Hell—screams, noises, men blasted to bits before your eyes, only yards away. I wish those who sacrificed their lives could have been there to see the finish. Those that were left each received a written citation, a copy of which is attached. Our company suffered a higher percentage of losses than any other company of its origin in the history of the Navy. I am proud to have been a part of it, but on the other hand, the ones that died should get all the honor and glory bestowed upon them. They gave their lives so that we might again enjoy a free world of happiness. I take my hat off to those boys. We knew most of them, and a finer bunch of fellows will never be found. It is a great honor to have known them. Forgive me for writing like this, but a fellow has to let go once in a while. Being held down so long, it is quite something to have a little freedom. I will let you know how we make out every chance I get. Note: The written citation is an award. Chuck forgot to include the citation with this letter and it was attached to the next letter. 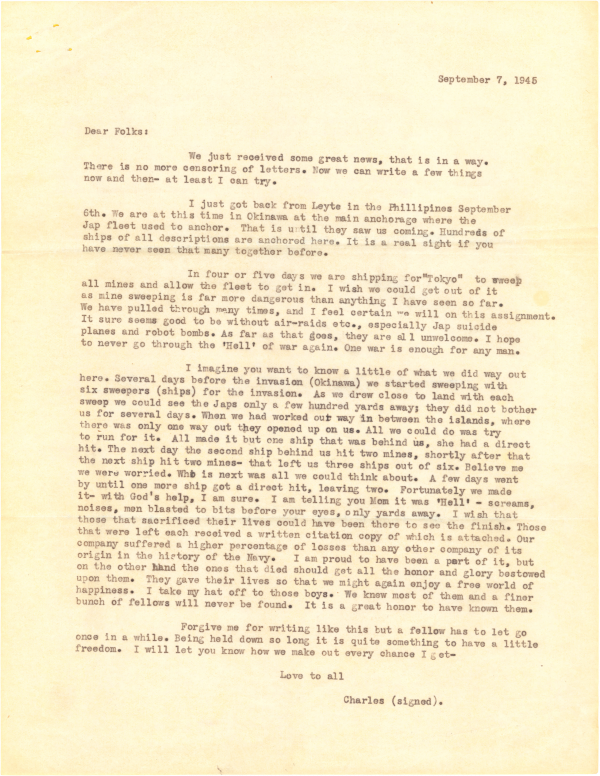 This entry was posted on September 7, 1945, 8:00 pm and is filed under During Battle, Letters, Soldiers, Timeline. You can follow any responses to this entry through RSS 2.0. You can leave a response, or trackback from your own site.